It’s one of the oddest results of Florida’s record cold temperatures. People are bundling up, fruits and vegetables are being covered in frost, and, amusingly enough, iguanas are falling out of the trees. 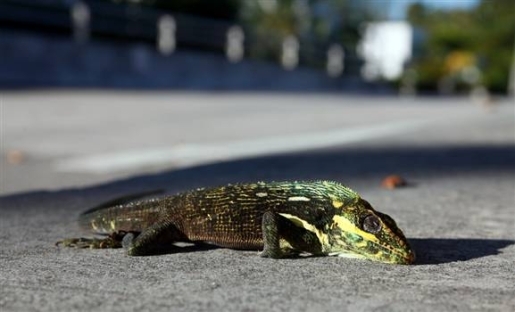 These tropical lizards are a common invasive species in Florida, thanks to people releasing their old pets into the wild. However, like most cold-blooded tropical critters, they don’t like freezing weather. It lowers their body temperature enough that they go into a coma-like state, which results in them tumbling from trees by the hundreds. Looks like that guy will have to find his dinner elsewhere!